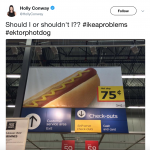 Oh, Ikea. How we love you. And yet, with any great love, comes complications. 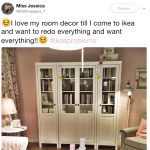 Whether you’re obsessed with Ikea or can’t stand to be inside of one, chances are that you have some feelings about it. And most likely, others have felt the same exact way. 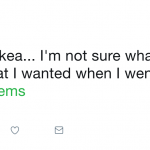 Here are some thoughts that everyone has inside of an Ikea. The names of Ikea furniture are the best. Sometimes it’s hard to understand what people mean when they say the names of Ikea furniture. 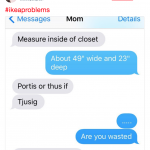 This text exchange is hilarious. For sure, the best maze out there is an Ikea. 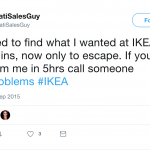 Who hasn’t gotten lost in an Ikea? The kids will totally enjoy it. Finding the way out of an Ikea is beyond hard. Who needs escape rooms? Gather your friends and spend your Friday night at the local Ikea! To be fair, everything in the store is really nice. 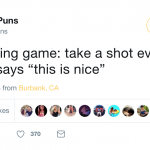 But yes, that would totally be a great drinking game. It would be nearly impossible to avoid saying “this is nice” in an Ikea. But for real, why are the instructions so complicated? They always seem so easy, but by the second hour of assembly you’re pulling your hair out. 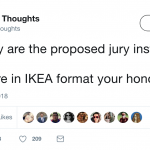 It’s both the gift and the curse of Ikea. The next thought is hilariously accurate. 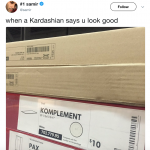 Do you think the Kardashians shop at Ikea? At some point, Kim, Kourt, and Khloe definitely had to go there for something, right? A kompliment from a Kardashian would be a dream. The person that walks the opposite way in Ikea is a total rebel. When you’re in Ikea, you know not to swim against the tide. You have to go with the flow or else surrender to the chaos. 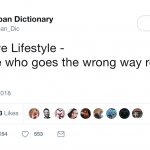 This is so relatable, it hurts. No car is big enough for a trip to Ikea. No car. 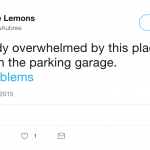 Being overwhelmed there is a given. You can’t expect a trip to this place without some sort of anxiety. 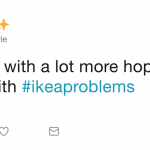 Anxiety and Ikea go hand-in-hand. It’s only natural that eventually, you start to wonder about the power of Ikea. Are they waiting until everyone has a Hektar lamp in their house and then strike? 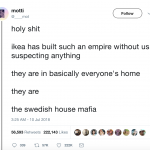 We’re onto you, Ikea. We’re onto you. The next thought is definitely one that we’ve all had. Because that’s how shopping at Ikea works: buying furniture and storage for things you don’t have, but suddenly you need to acquire for said furniture and storage. Ikea is a place you go when you want to realize how much you hate everything in your own home. You were perfectly happy with your own decor before you walked in through those giant, sliding doors. 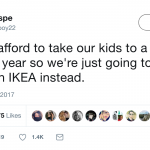 But when you leave an Ikea, you’re suddenly ready to re-do every room in your house. Shopping at Ikea is exhausting. Definitely worth it, but totally exhausting. If you accompany someone to Ikea, chances are you’re just dreaming of the treat you get to enjoy afterward. It’s worth it for the cinnamon bun. It’s always worth it for the cinnamon bun. You should always have an emergency contact listed when you enter an Ikea. What if you never make it out? There are so many twists! So many turns! It’s an adventure every time you go in. Keeping reading for more accurate thoughts. Never expect to spend less than $100 at Ikea. SILLY YOU! 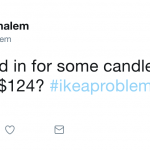 You thought you could only buy candles at Ikea? Think again! 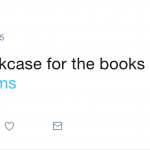 And yes, you definitely needed that bookshelf and those wine glasses. 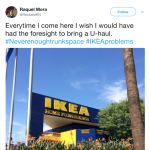 Ikea should provide U-Hauls when you go shopping. 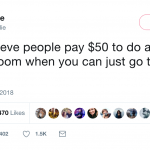 It would be the considerate thing to do, after all. 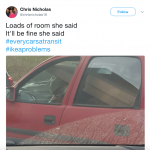 There’s only so much one can fit into their car. 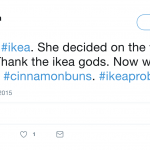 If you go into Ikea without a game-plan, you’re toast. You’ll totally black out when you’re in there, and then once you’re home, you won’t be able to remember anything you bought. Sometimes the food is the best part of Ikea. How can you resist that hot dog? A Swedish meatball? Furniture and food are two things that a human just can’t live without. 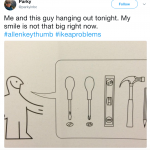 Those Ikea instructions will haunt you forever. No matter how much you enjoy being in the store, you know that you’ll end up with that little guy on the instructions, trying to figure out how to put things together. You may lose your patience, but you can do it! Make sure to share this with a friend on Facebook who loves Ikea as much as you do!